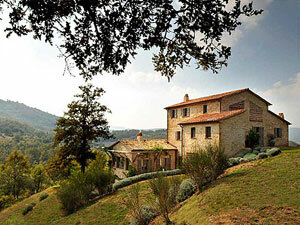 Spinaltermine is one of ten 5-star luxury villas available to rent on a private estate of Castello di Reschio. This private estate covers 2,000 acres of Umbrian countryside with expansive views of rolling hills, olive groves and vineyards and forests of ancient oak and chestnut trees. Little has changed since St. Francis of Assisi preached here in the Middle Ages. Spinaltermine is a private haven, accessed by a 3 km private road, with magnificent views over the private sanctuary of the Castello di Reschio estate. The grounds and garden offer several places to sit or dine in the shade or out in the open, depending on the season. The main house has 4 bedrooms and there is also a 1 bedroom guest house. This light and spacious home is elegantly furnished and is ideal for entertaining with the large open-plan kitchen and living room. It is also the perfect place to relax with a heated infinity swimming pool, with kitchenette, as well as covered sitting and dining areas. Enter into the fully equipped, open-plan kitchen and living room and to the left is a covered dining area. To the right of the living room is an indoor dining area and covered indoor/outdoor sitting area. Beyond the dining room is a shower, cloak room, laundry and a library. Up a flight of stairs is a landing; to the right is a double bedroom with an en suite shower room. Ahead of the stairs is a double bedroom with en suite bathroom. Finally, to the left of the stairs is a twin bedroom. Up to the top of the stairs is the master suite. In the master suite is a double bedroom with en suite bathroom and dressing room. Enter at the lowest level into a double bedroom with en suite shower room. On the top floor is a pool changing room with shower and bathroom, a kitchenette and a covered lounge area.